I wanted to take a quick moment today to thank all of you again for a wonderful school year. While we have had to endure some major changes, we have done so with pride, determination, and trust. When I look back, aside from the budget challenges that we have had, we also have created a new anti-bullying program, written a new performance evaluation system for teachers and administrators, implemented the new "Common Core Learning Standards" for math and English, worked through an energy performance plan that has saved the district thousands in utility costs, negotiated nearly thirteen contracts, and sold property to make budget pressures less severe. Redistricting Plan - The District also studied redistricting as well as full day Kindergarten. At the Board of Education meeting last evening, the "Option B" redistricting plan and full day Kindergarten was approved for implementation beginning in September of 2013. Both of these initiatives have importance. For redistricting, "Option B" will impact those who live in the areas outlined on slides 29-33 on the redistricting presentation that can be found here. Now that the Board has made the decision to redistrict, the responsibility falls on me to implement the plan. those students who will be in 5th and 8th grades in 2013.
those students that live on either side of non-main roads that are located on the outer perimeter of the the impacted areas. the discussion of the transition plan between buildings and school communities in general. to organize an implementation team comprised of staff, Board of Education members, and community members (both from impacted and non-impacted areas) to help get us to where we need to be by September of 2013. As with anything that we do at West Genesee, extreme care will be used to make sure that all students being transitioned are comfortable with their new surroundings. Please stay tuned. Full Day Kindergarten - For full day Kindergarten, we will be working with our elementary principals and teachers to revamp curriculum to meet all of the new requirements related to the Common Core Learning Standards. We will then work to inform the public, both inside and outside of West Genesee, that we have full day Kindergarten available for September of 2013. Full day Kindergarten is a first for West Genesee and I am looking forward to the increased achievement and socialization that a full day experience will bring our children. The future continues to be bright for West Genesee, and I appreciate your support. Although I am working most every day throughout the summer, I am going to take about two weeks off from the blog so you will see another post right after July 4 unless there is breaking news that needs to be shared sooner. I hope all of you had a wonderful weekend and a Happy Father's Day. I had a great day except for falling off of a ladder after I got stung in the face by a hornet! Luckily, my years of watching action movies helped me to brace my fall to live another day. 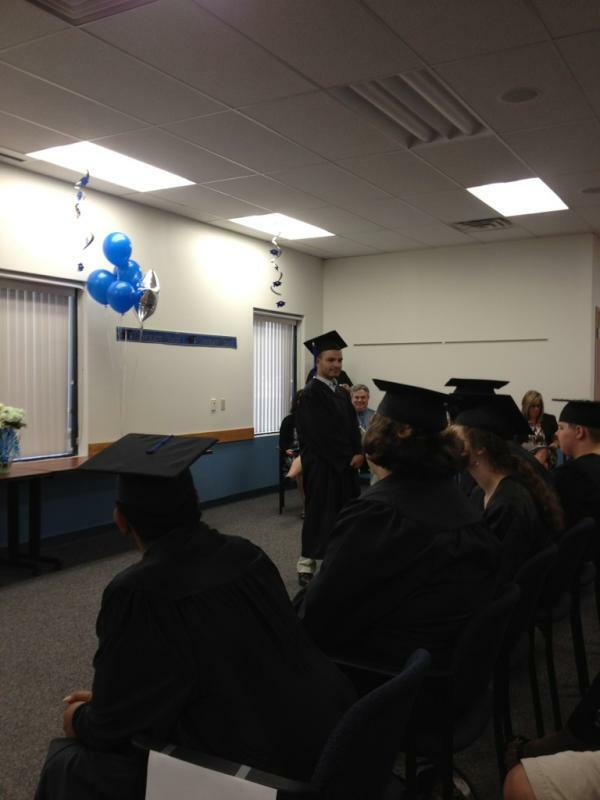 On Saturday we held a wonderful graduation ceremony at the Onondaga County War Memorial. This was a very special class that became close through loss. This class had amazing inner strength and resolve as well. The icing on the cake was being able to watch graduate Tyler Zapisek descend the stairs after receiving his diploma and finding his father there waiting for him. His dad has been deployed and away since March 1, and Tyler had no idea that he would be able to make it back to see him graduate. Pretty amazing to watch. A link to my graduation speech can be found by clicking here. With this graduation in the books, I am officially the parent of a senior. Unbelievable to think that in less than a year I will be handing him his diploma; considering both of my boys have never known me as anything other than superintendent and dad. I am keeping this message short as we wrap up the school year. If you are able to follow me on Twitter, I will be in every building and hope to capture what it looks like to finish a school year in the elementary buildings. 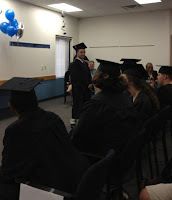 I borrowed the title of this blog from a young lady who was speaking at her BOCES graduation last week. She was receiving her GED, or General Education Development completion certificate, as were seventeen other students from a variety of other area school districts. If you thought that "college and career" ready got under my skin in the last blog, don't even get me started about how New York State defines a drop-out. As I watched these seventeen students complete their work and receive their GED, they were tearfully proud of their struggles to beat education and make their way to the next level. Every student had a different story as to why they could not complete their studies in a traditional school program. Some had to do with just plain old laziness, but many had to do with family health issues, needing to be responsible for earning money for the home, and a variety of other paths. At the end of the ceremony I learned that all seventeen of these students were employed and that more than half of the group was planning on going on to college. I was proud for them and their families. At the end of the year when all is said and done each home school has to mark them as a drop-out, per the New York State Education Department definition of drop-out. Again, don't get me started. They all have value to me, and I was pleased to be a part of their celebration. 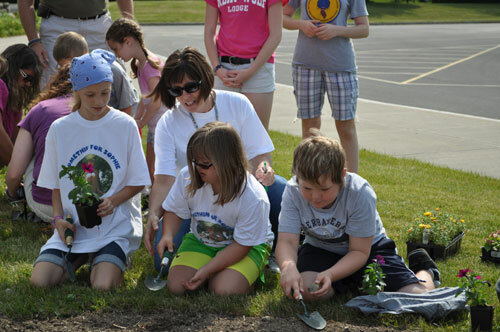 Late last week I also had the honor of participating in the ribbon cutting ceremony for a memorial garden that was planted at Stonehedge Elementary to honor the life of third grader, Sophie Kawejsza. The ceremony was attended by her class, Mr. Gerst and Mrs. Keevil, her building Principals, the Kawejsza family, her bus drivers, and many others who were associated with Sophie in some way. It was a true tribute to a strong young lady and we will all remember her each time we pass this wonderfully flowering garden. Over the weekend the Lady Wildcat Lacrosse team made us all proud by winning the New York State Class A Girls Lacrosse Championship. Senior leadership and an overall team effort helped the Lady Wildcats to bring home the title. The team will be graduating 16 seniors, each of whom will have a lifetime memory. Congratulations! Also on the lacrosse field Junior Vicki Graveline was named the ESPN Eastern Regional Lacrosse Player of the Week. Thanks for keeping us on the National radar! The sports season will culminate this Thursday with the Athletic Reception that recognizes outstanding seniors and their contributions to our athletic program. The Board of Education also heard the entire redistricting presentation from the consultants hired to study the issue. They interacted with each other, the consultants, and the audience as they began the process of formulating a final decision on redistricting and full day kindergarten. I cannot speak for the Board, but I would estimate that they would reach a decision point at either the next Board meeting (June 20) or at a meeting in the near future. Once a decision is made, the logistics and other considerations related to the initiative fall into my lap, and I expect to begin transition planning by August 1 for a 2013 roll out. Stay tuned and all supporting materials to the redistricting plan can be found by clicking here. Believe it or not, the next time I write we will have completed our 2012 High School Graduation, and I will then be the parent of a high school senior. I have no idea where the time went. Have a great week. On Monday I gave all of you a homework assignment to come up with your own thoughts on what it means to be "College and Career Ready". I hope you spent at least a few minutes thinking about the topic as this buzz phrase is going to occupy the airwaves shortly as New York State ramps up their efforts towards increasing graduation rates. It is my opinion that in a perfect world college and career ready means that a student has experienced everything that could possibly be offered in a school setting including a full course of academics, electives, clubs, activities, fine arts, and athletics. The student would then be ready to make a well-rounded decision about what they want to do after high school. New York State feels that being college and career ready means getting a grade of 75 on the 11th grade English Regents Exam and an 80 on ANY Math Regents Exam. It is my view that the danger with their definition versus mine is when you splash in financial instability there might be a lowering of graduation requirements and significantly less emphasis on anything that may not be measured in the long term. I am a realist and understand that lobbying groups for each area will likely extend the life of most opportunities well into the future. However, I thought you would like to know what the baseline is for being college and career ready. So I would like you to erase every other experience you had at school except for your 11th grade English and any Math classes that had a Regents Exam attached and imagine where you might be today. New York State recently received a waiver from the Federal No Child Left Behind requirements. These requirements placed significant penalties on schools whose students with disabilities or economically disadvantaged students did not perform well on state assessments or in graduation statistics. In my own plain language the waiver essentially lifts those penalties for a longer period of time except for those schools that have been under-performing on a consistent basis. While this seems like a win as most schools have high standards for all students anyway, the flip side is that the Federal Government is going to cut funding for services that are allocated to students with disabilities and students that are economically disadvantaged. I do not know the impact of that for West Genesee as of yet, but it will need to be dealt with when the time comes and we will make it work. In my last blog I mentioned how well Caitlyn Barry did singing the National Anthem at the recent Save Modified Sports event. With permission from her parents, here is a link to her performance so you can see and hear for yourselves. http://www.youtube.com/watch?v=tZDLNcFuz9c&feature=colik Remember, she is in 7th grade. Also the "Mayor" of the high school, student Andrew Bowman, is going to be meeting up with the torch for the Special Olympics State Games on Saturday June 11, at around 2:30 p.m. in the Walmart parking lot in Camillus. He will be there along with the Law Enforcement members who will have run the torch to that location from a variety of areas. Way to go Andrew! We will also have a ribbon cutting tomorrow at 9:30 a.m. at Stonehedge Elementary School for a garden to memorialize 3rd grader Sophie Kawejsza. Sophie lost a hard fought battle with cancer earlier this year. All are welcome to attend. Lastly, I would like to congratulate all of our seniors as they complete the last week of their high school careers. They were freshman when I started here, and I have had a chance to really get to know them. This is a very special group of young adults and it will be tough to graduate them in a few weeks, but I know in my heart that they have received an education equal to my definition of "College and Career Ready". Best of luck to the lady Wildcat's tomorrow in the state semi-finals! What an amazing, busy, short week we just had that was jam packed with meetings, concerts, and sporting events. In the classrooms the big push to begin to prepare for finals is on and graduation is right around the corner. People always tell me that they can't believe that I would want to do this job, that it has to be the worst thing ever. It is fair to say that as the boss there are times when things are very challenging to deal with. However, if you were able to borrow my eyes for a day and see all of those "A-ha" moments, the power of empowering others, the results of teamwork and cooperation, and the pride in each member of our organization, you would hop out of bed each day as I do and be as excited as I am to get to work. 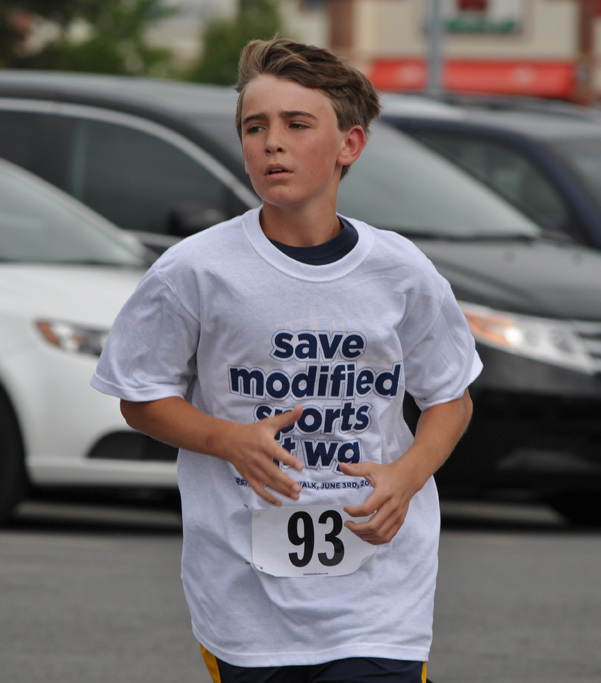 Save Modified Sports at West Genesee Event: One of those "A-ha" moments came over the weekend at the Save Modified Sports at West Genesee 4 Mile Walk/Run. The weather was overcast but the spirits sure weren't. Over 800 people registered to participate in the walk/run event that was followed by food (mostly healthy of course! 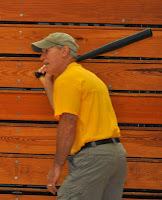 ), music, raffles, and a Wiffle Ball game between middle school staff in the gym. It would have been a softball game outside if the weather had cooperated. 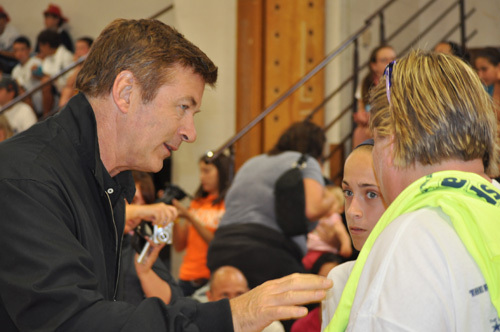 The Wiffle Ball game was DJ'd by our own staff member Mr. Burke, and actor Alec Baldwin was on hand to deliver some motivational words of support for the cause. He remained to meet with people, snap pictures, and thank those on hand for working towards a very good cause. 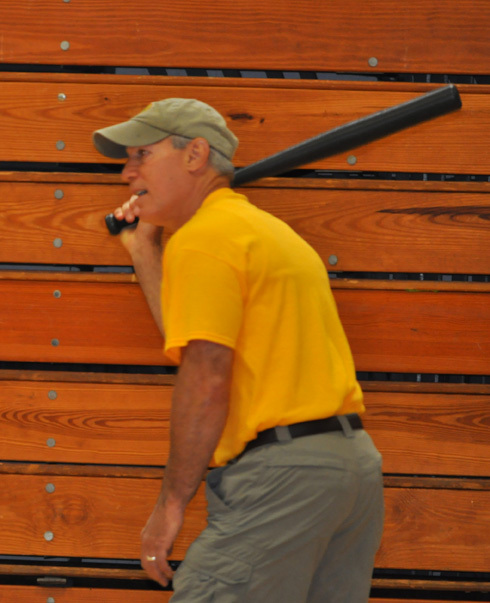 He passed along the first-pitch duties to WGMS seventh grader Grace Schnorr who plays on the modified softball team. She is pictured at left being asked to throw the first ball by Alec Baldwin and his sister, Jane Sasso. Grace got the job done with class and style. At the end of the Wiffle Ball game there was a tug of war between students from West Genesee Middle School and Camillus Middle School that ended with victory for West Genesee Middle School. The absolute highlight for me was not my personal best time in the four mile race (and not having a heart attack), but the singing of the National Anthem. I have probably heard the Anthem delivered a thousand times, but when West Genesee Middle School seventh grader Caitlyn Barry finished singing, the applause was deafening. What an INCREDIBLE talent. If someone has a video or recording of her performance I would love to get a copy to link to a future blog post. Events like these cannot take place without the support and coordination of many people and I sincerely appreciate all that the Modified Sports Committee did to make the event an organized, well thought out, and enjoyable success. Thanks also goes out to our Athletic Director Mike Burns, our custodians Jerry and Phil, and all of our other staff, students, and volunteers who helped out. I have taken some time to dig through the data so that I could form my own opinions based on the facts. The graph above shows 351 total students may be impacted by the redistricting option that will be presented by the consultants (172 total families). 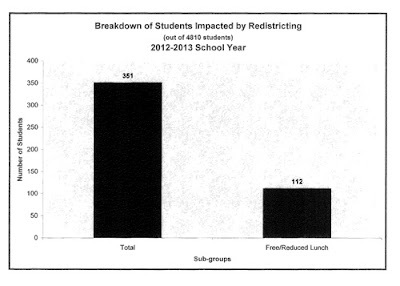 Of those 351 students, 112, or 32% receive free or reduced lunch. The data shows to me that the redistricting does not single out the less financially fortunate by a margin of 3 to 1. At any rate, the Board of Education will hear the full presentation by the consultants on June 6 and WILL NOT make any decisions until AT LEAST June 20. If you use the redistricting link that is on our home page you will have access to EVERY file, document, report, and presentation that the Board of Education has to work with as they narrow down their decision for not only redistricting, but for full day Kindergarten as well. Upcoming Week: This week is busy with awards for seniors and we also have a reception for our staff who will retire at the end of the school year. The week ends with the girl's lacrosse state semi-finals in Cortland on Friday, as they hopefully pull one out and head to the state championship on Saturday. I have several more topics to inform you about but I am going to wait until later in the week so you have time to digest all that I have written so far. Your home work assignment though is to come up with your own thoughts (don't use Google) about what it means to be "college and career ready". We will go over your homework on Thursday.